WoodPro All Purpose Construction Screws are used for a wide variety of interior and exterior applications from decking to flooring. The secure STAR drive recess helps reduce bit stripping and a sharp Type-17 point allows for easy starting and effortless drilling. Special nibs under the head provide a clean countersink in all types of material. These screws are coated by PPG Industries with a Golden Electro-Polyseal coating. PPG Industries E-Coat is superior to other types of coating because it allows for a thinner coat while still maintaining over 1,000 hours of salt spray protection. The coating is extremely durable in all-weather applications and will not chip or rub off. PPG coating is rated for use in treated lumber. 1lb and 5lb packages include one bit. WoodPro Drywall Screws are phosphate coated with a coarse thread to prevent pop-out. They have a sharp Type-A point for quick starting and effortless drilling. These screws are for interior use only and should not be used in treated lumber. 1lb and 5lb packages include one bit. WoodPro Composite Deck Screws are the perfect screw for your composite deck installation project. The secure STAR drive recess helps reduce bit stripping and a sharp Type-17 point allows for easy starting and effortless drilling. The dual thread design eliminates the mushrooming effect in composite and wood materials and provides a clean flush finish. These screws are color coated by PPG Industries with an Electro-Polyseal coating to match your deck. PPG Industries E-Coat is superior to other types of coating because it allows for a thinner coat while still maintaining over 1,000 hours of salt spray protection. The coating is extremely durable in all-weather applications and will not chip or rub off. PPG coating is rated for use in treated lumber. 5lb packages include one bit. WoodPro Washer Head Screws are coated by PPG Industries with an industry leading 1,500 hour Electro-Polyseal coating for consistent layering that prevents recess fill while offering superior corrosion protection. The stronger PPG coating helps prevent chipping for added exterior corrosion protection. The secure STAR drive helps reduce bit slippage and a sharp Type-17 point with a patented ASTER thread provides quick starting and effortless drilling. These screws can be used for a wide range of interior and exterior applications. Primary Applications: Post to pole framing, Insulation panels. WoodPro Trim Head Screws are coated by PPG Industries with a superior 1,000 hour Electro-Polyseal coating for consistent layering that prevents recess fill while offering superior corrosion protection. The secure STAR drive helps reduce bit slippage and a sharp Type-17 point provides quick starting and effortless drilling. The small head and thin shank are designed to prevent mushrooming and help conceal the fastener. For interior and exterior use. 1lb and 5lb packages include one bit. WoodPro Cabinet Screws are coated by PPG Industries with a superior 1,000 hour Electro-Polyseal coating for consistent layering that prevents recess fill while offering superior corrosion protection. The secure STAR drive helps reduce bit slippage and a sharp Type-17 point provides quick starting and effortless drilling. A large washer head provides increased holding power for heavy loads. For interior and exterior use. 1lb and 5lb packages include one bit. 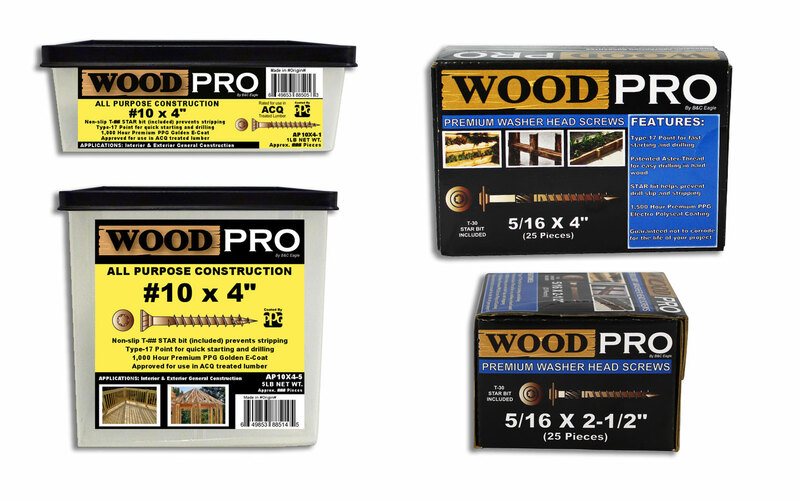 WoodPro packaged bits are color coded so you can easily recognize the size you require. Bits are sold in two packs or a multi pack of 5. Each bit is 50mm in length.